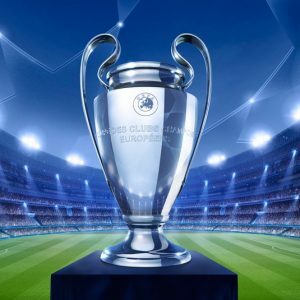 If you have already joined bet365 Sport (and if you have not yet done so, you can do so using the latest bet365 Sport New Player Promotion, which is offering new customers up to £100 in bet credits), then you will be aware that there is now a new option when it comes to betting on football (soccer) matches. That option is called Bet Builder and it is allowing punters an even greater degree of flexibility over their bets on football matches than ever before. Essentially, Bet Builder is a tool that allows you to create the bet that you want to make on any soccer match. You can select from a wide range of popular betting markets and add your choice of selections from these markets to your bet slip. Once the markets have been added to your bet slip, then the calculator will calculate the combined odds of your chosen bet, which you can then choose to bet on, edit or amend before you bet, or disregard and start again with some different selections. For example, you could place a bet on the forthcoming Chelsea v Manchester City match using the Bet Builder feature by making a selection from the First Goalscorer and Both Teams to Score market. What Markets can I bet on using the Bet Builder feature? On each Bet Builder bet you can make up to six different selections to comprise an element of your bet (which essentially makes it a six-fold accumulator bet, from seven different markets of the single match that you are betting on). As you can see from some of the examples above, you may find that within each of the markets there are different options available, for example in the Players to Score market, you can find that you can back the Anytime Goalscorer option, or the First or Last Goalscorer option as well as bets on individual players scoring two or more or three or more goals in the game. Furthermore, for some of the most popular leagues, you may also find that bet365 will accept other markets in addition to the ones listed above, such as betting on Free Kicks, Throw Ins and Goal Kicks, the Half with Most Goals and Double Chance options. The Bet Builder feature is set up to utilise these markets when placing your bet, so that you only add the correct markets to your bet slip. How do I place a Bet Builder Bet? 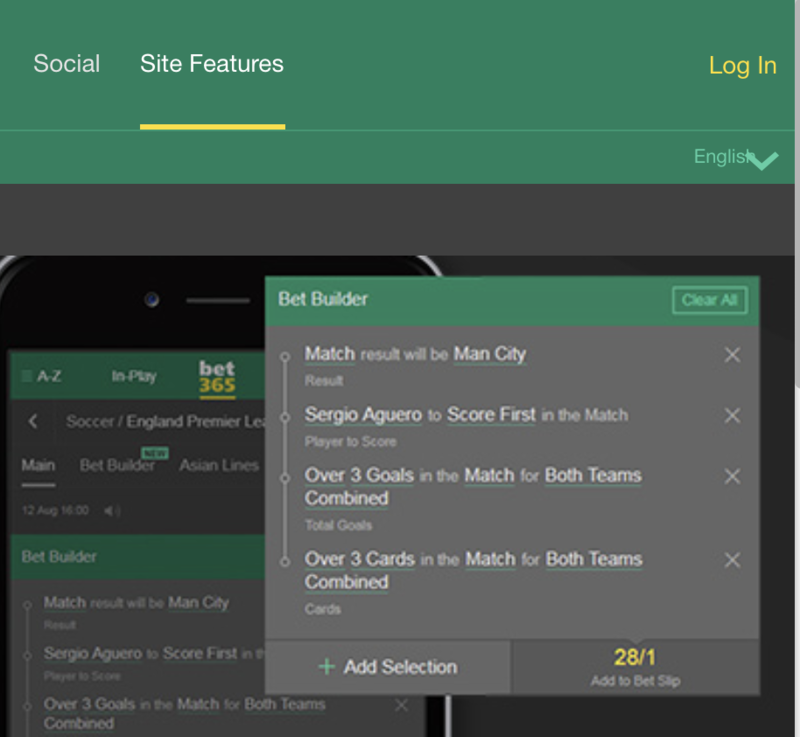 Using the Bet Builder feature is extremely easy. All you need to do is log in to your bet365 Sport account and then navigate through the sites soccer betting section until you locate the fixture you want to place your Bet Builder bet on. Once you have found your fixture, select the Bet Builder feature from the header and then click on the “Add Selection” option which appears below. Here you can then select which of the available markets for your bet that you would like to add to your Bet Builder slip. Once you have selected your first market, you then add another selection from those available until you have built your bet exactly as you want it. If you add a selection to your slip and want to then remove it, you can simply click on the X following the selection to remove that selection from your slip. One of the nice touches with this feature is that unlike some building a bet services, you are given an immediate price for your selections. This is shown in the bottom right corner of the bet slip on the Add to Bet Slip button. There is no need to wait for bet365 to get back to you with odds for your bet as the calculator does that for you instantly as you add selections to your slip. When you have completed adding selections to your bet and you are happy with the odds displayed, you then simply click on the Add to Bet Slip button. This adds your Bet Builder selection to your bet slip and you then simply need to enter your chosen Stake into the box and click the yellow Place Bet button to make your bet. How flexible is Bet Builder? In truth, how flexible Bet Builder is depends on the match in question and in particular, the number of different markets available for that game. 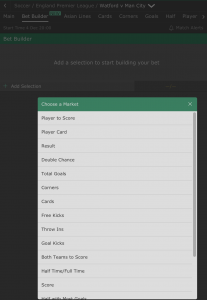 For lesser games, bet365 tend to offer fewer markets, but for big games, such as Premier League matches there are a wider choice of markets and this means there is far greater choice for punters when it comes to building their bet. With a wider choice of markets, this means you have more parameters to manipulate for each bet. For example, if you decide to back a player to score a goal in the game, you can back him to score Anytime, as the First Goalscorer or the Last Goalscorer. If you decide to place a bet on the Free Kick market, you can pick which team you want the bet to apply to, or whether you want it to apply to both, whether you want the first half, second half or whole game to be considered for the bet and lastly, whether you want under, over or exactly the selected number of free kicks to be awarded in the game. By manipulating these parameters inside each Bet Builder market, you have far greater flexibility to shape your bet. 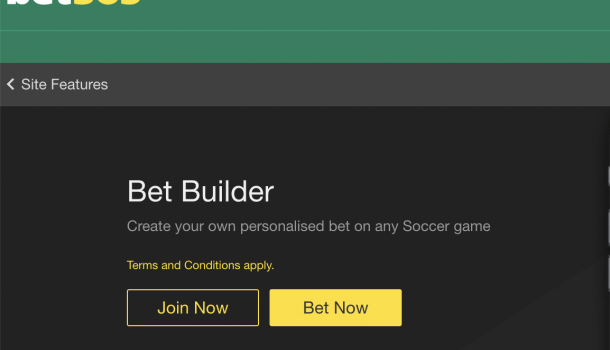 Bet Builder is a powerful tool and a very useful addition to the football betting section on the bet365 Sport site, but it is also a tool that is best used in conjunction with a little research into your game, the teams competing, the players likely to play and particularly on the markets you want to bet on. Research can help you avoid building bets which may look enticing on paper and have decent odds, but which the stats suggest may not have a very good chance of coming in. For example, if you back a team to pick up 4+ yellow cards in a game and to score away from home, when the stats suggest that they only tend to get one or fewer bookings in a game and rarely score on the road, then you may wish to consider changing your Bet Builder selections to reflect this. The legwork you put in researching your bets will certainly give you a better chance of using the excellent Bet Builder service more productively over the course of the football season. Will the Gunners Shoot Down United in Wednesday’s Premier League Cracker?